For Museum, Long-Lost Picasso Is Too Costly To Keep For more than 40 years, Pablo Picasso's Seated Woman with Red Hat went unnoticed in the Evansville Museum of Arts, History and Science's storage area. Now that it's resurfaced, the Indiana museum says it can't afford to insure the multimillion-dollar artwork. Industrial designer Raymond Loewy purchased Pablo Picasso's Seated Woman with Red Hat (or Femme assise au chapeau rouge) in 1957 and gifted it to the Evansville Museum in the '60s. In the southwestern Indiana town of Evansville, people are a bit baffled after hearing that the town's Museum of Arts, History and Science has had a rare Pablo Picasso piece in storage for almost half a century. Curator Mary Bower says the work went unnoticed because of a clerical error. "All the documentation associated with the gift indicated that this was by an artist named Gemmaux," she says, "which really happens to be the plural of the artistic technique." That technique, gemmail, uses layered glass to create 3-D art. The work remained miscataloged for more than 40 years, until Bower got a call from Guernsey's auction house in New York. They were doing research on the special glass technique Picasso used and had tracked one of the works to Evansville. "I thought, 'Yes, I do need to check in on that,' " Bower says. Lo and behold, the piece in the museum's storage area was a rare gemmail, one of only 50 Picasso made. 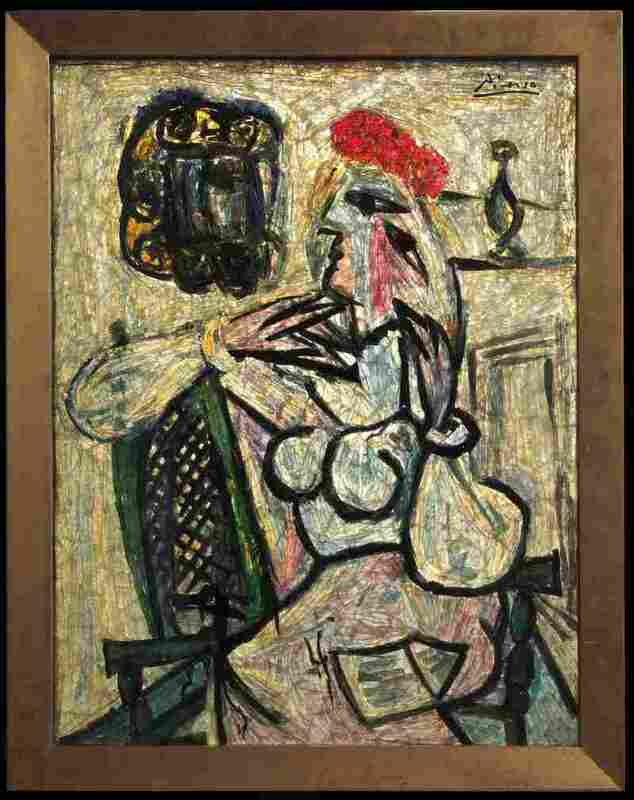 It's called Seated Woman with Red Hat, and it's iconic Picasso, with thick black lines that mimic his brushstrokes. Since its discovery in February, there has been a flurry of appraisals and meetings with the museum's members and board of trustees. They discovered that the value and rarity of the piece made it impossible for them to keep, so the board voted this month to sell it instead. The museum enlisted Guernsey's to help it find a home for the work through a private sale. Guernsey's President Arlan Ettinger says, "To suggest that this might be in the $30 [million] to $40 million range, I think, is probably a fair assessment." That's precisely why the museum can't keep it. With only one guard on duty in the gallery, it would be nearly impossible to provide enough security. Robert Pittinger is with the insurance company AXA Art. He won't guess at how much it might cost to insure the Picasso, but he says his company wouldn't take on the risk of insuring a piece unless it had the right protection. "Is it hung properly? Is it in an environment where it is climate controlled? Is it in an area that is not susceptible to excess light?" Pittinger asks. All of that protection can get expensive. At the Evansville Museum, where artwork is crowded on the gallery walls and the entire collection is valued at only $10 million, modifying the space would cost more than the actual insurance. The irony is that if the museum had the money from the sale of the Picasso now, it could probably afford to keep it. Guernsey's won't say when the sale of Seated Woman will be finalized, but whether it takes two weeks or a month, one thing is for sure: The people of Evansville won't get a chance to see it, at least not at their local museum. "Part of the joy of the job is to be able to share works of art with the museum community, the Evansville community and the region," says curator Bower. "So I'm disappointed. I'm sorry that it won't be displayed." If there is a silver lining, it's that after the sale, the museum will have funds for new works and special exhibits — the American Association of Museums' code of ethics says proceeds from the sale of artwork have to be used for shows and preservation.